About Astir B. Message Astir B.
Astir has been very help to us on our 1 day whirlwind tour of the falls - both Brazil and Argentina sides. He helped us a lot and we are very pleased to know him. We hope to travel with him further in future tours of ours .. given an opportunity. We booked Astir for a 2 day tour of Iguazu Falls. Astir was extremely accommodating. When I realized that I had given him the wrong tour dates, he quickly arranged for another guide for the day that he was not available. On the first day he offered us several options for the tour, arranged the activities in the best order to maximize out time at the Falls, and gave us plenty of time to take pictures. We didn't feel rushed by him at all even though our day went longer than originally planned. Perfect day! TOUR GUIDE RESPONSE: Good morning, thank you so much Mr Slattery, I'll accept your suggestion. Astir. 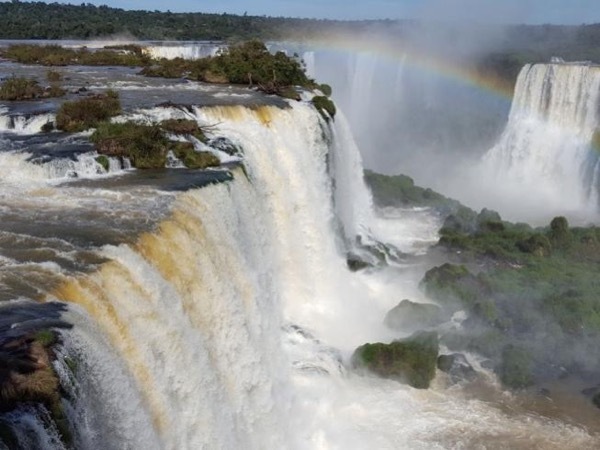 Astir is very experienced, very knowledgeable about the Brazil and Argentina sides of Iguazu. He helped us design a tour suitable for our group of 12, including the national parks on both sides of the falls, a boat ride and a visit to the 3-country monument. He provided airport to airport service and 2 days of touring. He prepared documentation ahead of time so we could cross the Brazil / Argentina boarder quickly and efficiently. I fully recommend Astir as your tour guide. TOUR GUIDE RESPONSE: Good morning dear Vito, thank you very much for your consideration, it was a great pleasure to be able to meet you and show you some of our attractions. Many thanks and a warm hug to the whole group. Astir is an amazing talent. Great guy and very deep understanding of Iguacu Falls. The guy can hike and gave me a workout (which was fine, though after much travel my 76 year old body was out of gas). With his complete understanding, and with a schedule change, I was able to spend the afternoon of our second day hanging out at the swimming pool of the Belmond Hotel - very nice and I needed the break. TOUR GUIDE RESPONSE: Dear Andrew, it was with great pleasure that I accompanied you on the tours during these two days, always seeking to meet the needs and expectations of the visitor, as well as adapting scripts in your favor. It was a pleasure to serve you on these tours. Thank you very much. Astir B.
Astir took my daughter and me to the Argentinian side of the Iguazu Falls. We have a fantastic day. He was courteous, polite, on-time and knowledgeable. He was also flexible and help us all the way. His English is very good. I would recommend him 100%. TOUR GUIDE RESPONSE: Many thanks Mr Angel, it was an immense pleasure to be able to meet you and show you one of our wonders, thank you very much. Astir B.